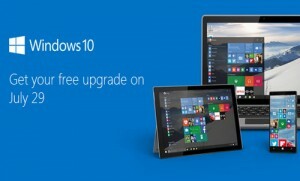 Windows 10 is coming July 29th, 2015! For a limited time, you can get a free Windows 10 upgrade for qualified Windows 7 and Windows 8.1 devices (including devices you already own). Looks like my 5 year old netbook will be getting an upgrade, glad I didn’t buy Windows 8. If you’re currently using Windows 7 or 8/8.1 (with the latest updates installed) you should see a small Windows icon located at the right end of the taskbar. Click ‘Reserve your free upgrade’ in the app window and enter your email if you want confirmation of this reservation.